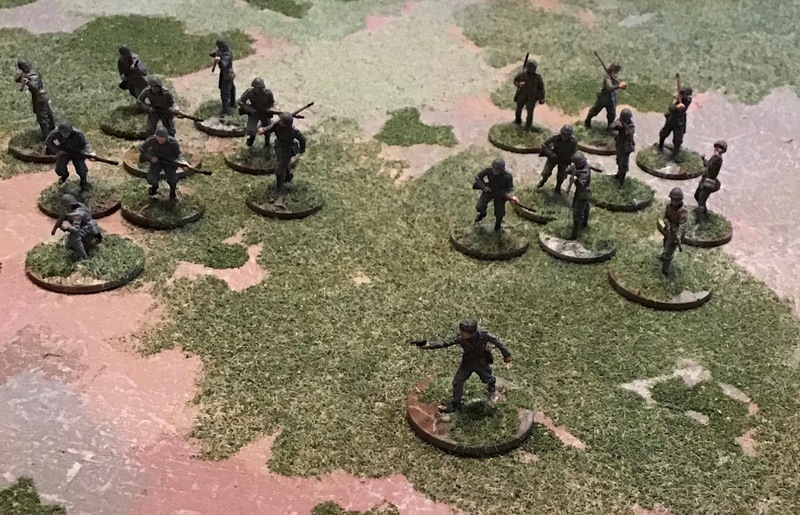 The first Italian platoon for the Menton 1940 game is finished along with a few support options. For what began as a way of using up some Airfix Italian infantry I had going spare, this project is, as usual with these things, suddenly involving buying a load of stuff I didn't have. 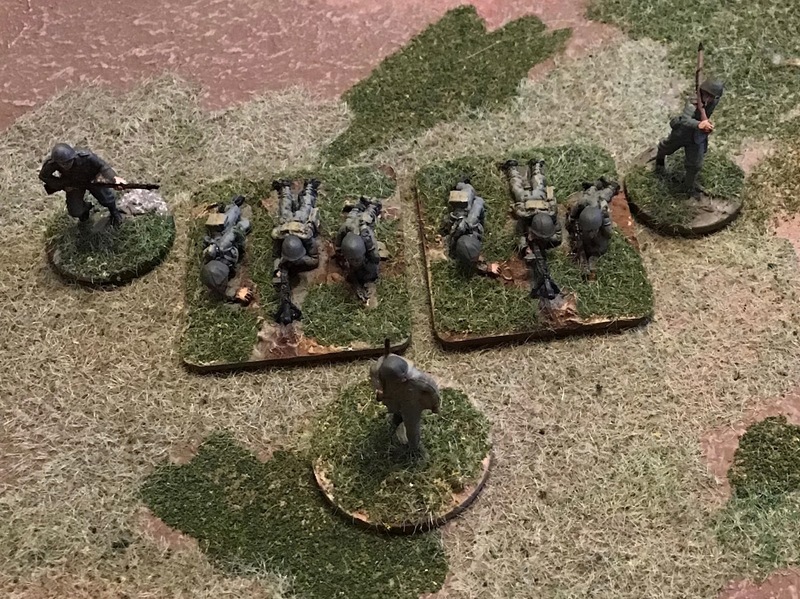 The Italian Fucilieri platoon has an odd structure. It's divided into two Squadri, each with two machine-gun teams and an eight man rifle team. The platoon HQ is just a Tenente. Each MG team has a three guys manning a Breda M30 LMG and an extra rifleman and the two teams are led by a single Caporale. 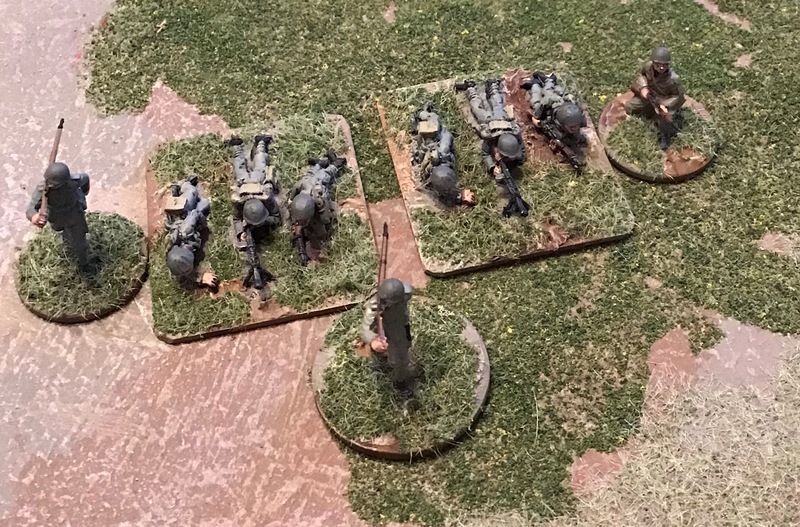 The three-man LMG teams are from Dixon Miniatures. 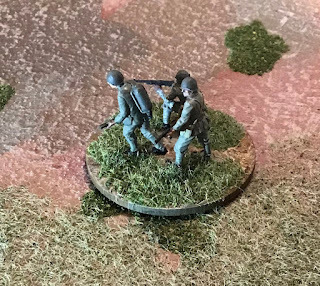 The spare rifleman at the right end of the line above is an Airfix Japanese infantryman with a transplanted Italian head. It's not clear in the photo but he's wearing a rather natty black, polo-necked sweater under his jacket. 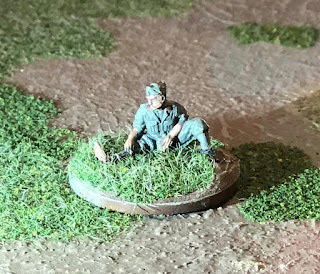 The second Squadra's MG teams are led by a Caporale whose an Airfix Japanese infantryman simply repainted in Italian colours. 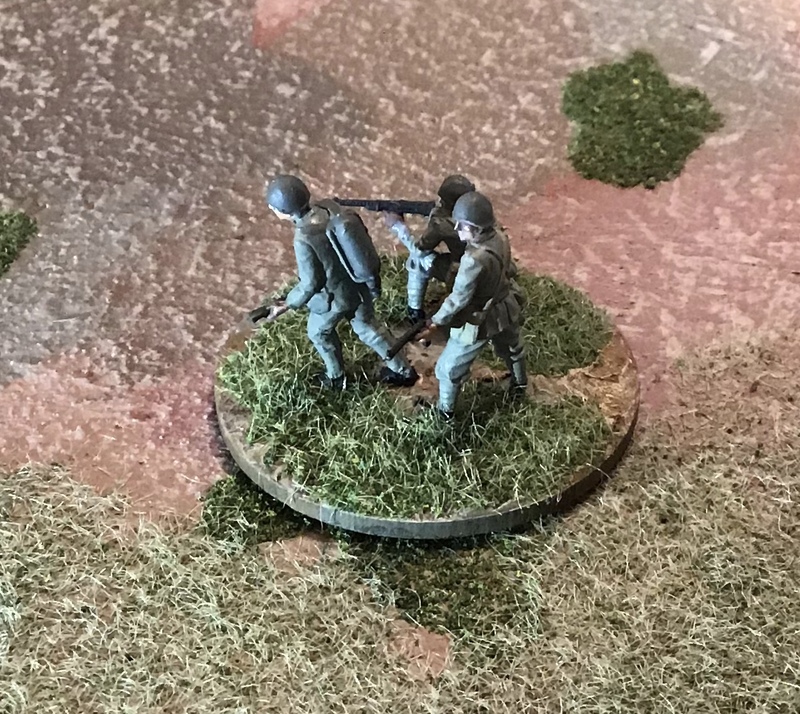 For me these are Vallejo Green Grey for the cloth items and German Fieldgrey WWII for the helmets. Some of the knapsacks are in Vallejo Khaki. The rifle teams are mostly Airfix Italians with a few helmeted Japanese thrown in. Bothe uniforms have cloth puttees and the helmets are similar in shape so I think this works OK. I've done a few support choices for the Italians. I'm trying these days to make sure I have some wounded figures to show when Leaders are wounded in Chain of Command. This guy is an Airfix Australian with an Italian officer's head transplanted on and with a little carving to correct the shape of the puttees. Again demonstrating how a "cheap" army has led to a number of additional purchases, I went and bought the Italeri Alpini box. 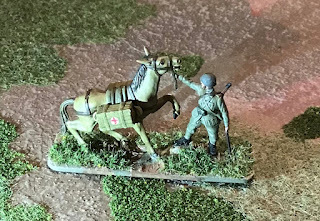 Removing the feathers from their steel helmets I end up with a number of useful models, although they are a tad larger than their Airfix brethren. This muleteer will do service as a medical orderly in Chain of Command games. Last up we have this flamethrower team. The flamethrower crewman himself is an Airfix German with yet another head transplant. I've painted his tall marching boots as puttees. 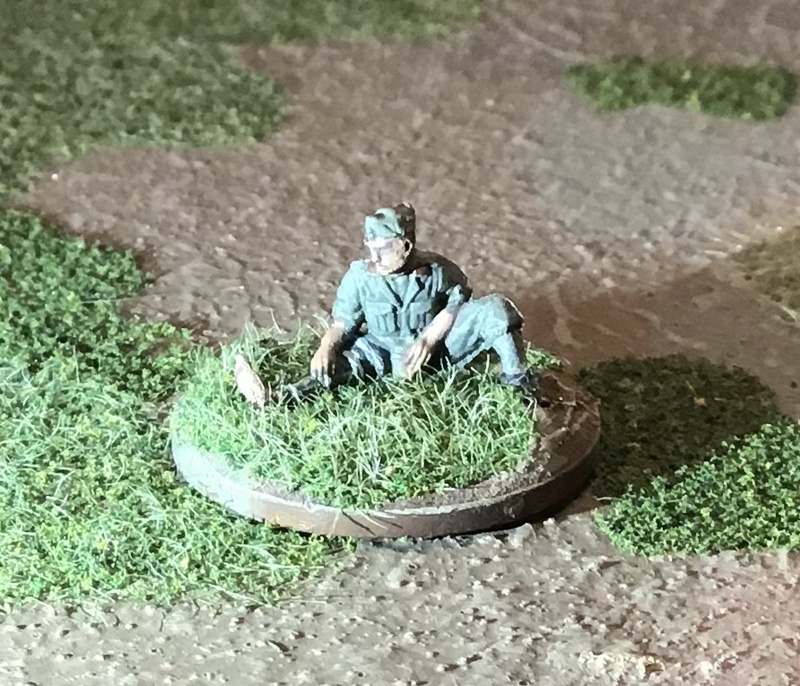 The Airfix Italians box is over-generous with SMG-armed men and I've used two of them here. All of the men have dark red (Vallejo Burnt Red) collar "flames" as they will be used to represent to troops of the Cosseria Division at Menton.